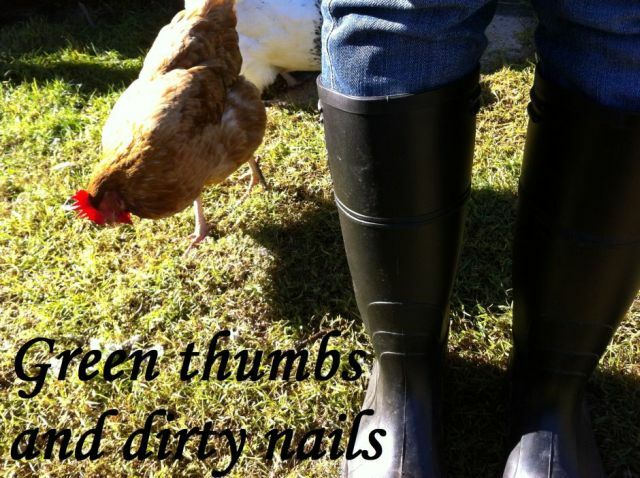 Green thumbs and dirty nails...: Give me land, lots of land under starry skies above. Give me land, lots of land under starry skies above. Jamie and I now have land under our feet to call our own. We have moved to a rural location and now live on about 2 and a half acres of land, in a 70's style weatherboard house. For the past few months we have been busy unpacking boxes, setting up the house, doing huge amounts of yard work and getting used to our new routines as a one car family with absolutely no public transport nearby. I won't tire you with all the boring details… you want to know about my new garden, right? Where we had been living previously, we were renting and had a relatively small backyard. We had been fortunate to have a very good landlord who was okay with us growing vegetables and keeping chickens and ducks. He didn't mind when we built our chicken coop, nor did he mind when we started breeding ducklings (at one point we had over 30 birds in our backyard). As great as he was, and as beautiful a place as it was to live in, it was never really ours. I was pretty limited with what I could achieve as I was always conscious I didn't want to build anything too permanent, or put too much money into the garden, knowing that we would have to move on one day. A 'before' shot of the vegetable patch. Establishing a vegetable garden on our new land was a bit challenging at the beginning. The soil conditions were a very similar poor quality to our previous rental property. Due to our costal location our soil is incredibly sandy, meaning that it is pretty low in organic material and also struggles to hold moisture. My first port of call was organising a couple of cubic meters of compost to be brought in and spread out over the vegetable plot. I then applied some soil conditioner that helps to hold the water. Another challenge we discovered soon after living in our new home for a few days was that we had a wild rabbit family also sharing our land. They came out at dawn and dusk, and munched on anything they could. This meant that any vegetable garden we established needed to be rabbit proofed to protect our crops. I found a number of half sleepers around the property that I was able to use as posts for the vegetable garden fence. I dug deep holes and cemented them in place (the holes needed to be quite deep due to the sandy soil). I used rapid set cement. Once they were secure I screwed in place lattice panels that I bought from our local hardware store. These gave a nice look on a budget (about $8 per panel). Along the bottom of the panels I ran chicken wire, and secured this to the panels then onto the ground with a brick (see photo for better detail). This vegetable garden is quite huge. It is big enough to have a variety of crops growing at one time, with enough space left over to grow green manure crops and do a little bit of progressive planting. I decided to split the patch into two, and run a path down the centre. This has turned out to be a really good decision, as I am able to run a wheel burrow up and down the path with ease. The other bonus of our new place is that it came with its very own potting shed! A shed to call my own. It feels great to be back journaling my gardening activities. I can't wait to share with you more of my vegetable garden progress. Looking good! And a potting shed too. What wonderful news! I'm totally jealous, and happy that you're back to blogging! You've been missed.